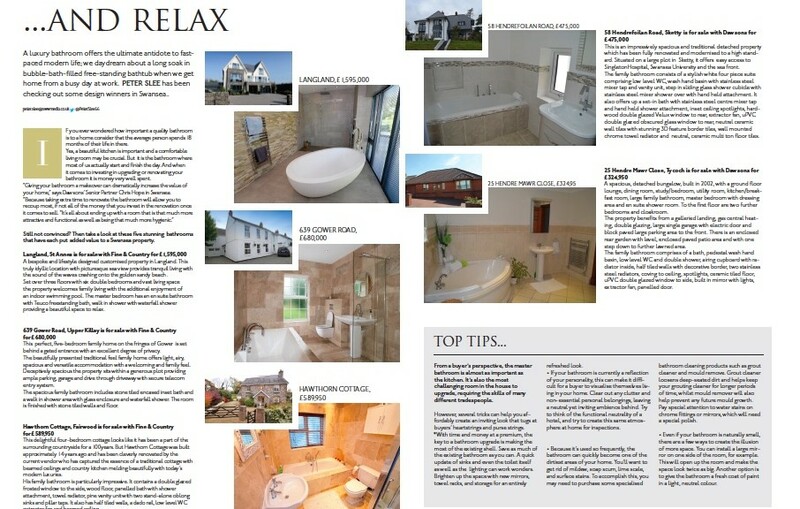 January’s edition of Swansea Life has included a special feature on spectacular bathrooms provided by Dawsons Property. If you ever wondered how important a quality bathroom is to a home consider that the average person spends 18 months of their life in there. A lovely kitchen is important and a comfortable living room may be crucial, but it is the bathroom where most of us actually start and finish the day. And when it comes to investing in upgrading or renovating your bathroom it is money very well spent. “Giving your bathroom a makeover can dramatically increase the value of your home,” insisted Dawsons’ Senior Partner Chris Hope. “Because taking extra time to renovate the bathroom will allow you to recoup most, if not all of the money that you invest in the renovation once it comes to sell. Here we look at five different bathrooms that have put added value to each property. A bespoke and lifestyle designed customised property situated on Gower coastline in Langland. This truly idyllic location with picturesque sea view provides tranquil living with the sound of the waves crashing onto the golden sandy beach. Set over three floors with six double bedrooms and vast living space the property welcomes family living with the additional enjoyment of an indoor swimming pool. The master bedroom has an en suite bathroom with Teuco freestanding bath, walk in shower with waterfall shower provides a beautiful space to relax. The perfect, five-bedroom family home situated on the fringes of the Gower Peninsular is set behind a gated entrance with an excellent degree of privacy. This beautifully presented traditional feel family home offers light, airy, spacious and versatile accommodation with a welcoming and family feel. Deceptively spacious the property sits within a generous plot providing ample parking, garage and drive through driveway with secure telecom entry system. The spacious family bathroom includes stone tiled encased inset bath and walk in shower area with glass enclosure and waterfall shower. The room is finished with stone tiled walls and floor. This delightful four-bedroom cottage looks like it has been a part of the surrounding countryside for a hundred years, But Hawthorn Cottage was built approximately 14 years ago and has been cleverly renovated by the current vendor who has captured the essence of a traditional cottage with beamed ceilings and country kitchen melding beautifully with today’s modern luxuries. And the family bathroom is particularly impressive. It contains a double glazed frosted window to the side, wood floor, panelled bath with shower attachment, towel radiator, pine vanity unit with two stand-alone oblong sinks and pillar taps. It also has half tiled walls, dado rail, low level WC extractor fan and beamed ceiling. This is an impressively spacious and traditional detached property which has been fully renovated and modernised to a high standard. Situated on a large plot in the desirable area of Sketty offering easy access to Singleton hospital, Swansea University and the sea front. The family bathroom consists of a stylish white four piece suite comprising low level WC, wash hand basin with stainless steel mixer tap and vanity unit, step in sliding glass shower cubicle with stainless steel mixer shower over with hand held attachment, set in bath with stainless steel centre mixer tap and hand held shower attachment, inset ceiling spotlights, hardwood double glazed Velux window to rear, extractor fan, uPVC double glazed obscured glass window to rear, neutral ceramic wall tiles with stunning 3D feature border tiles, wall mounted chrome towel radiator, neutral ceramic multi ton floor tiles. A spacious, detached bungalow, built in 2002, comprises to the ground floor lounge, dining room, study/bedroom, utility room, kitchen/breakfast room, large family bathroom, master bedroom with dressing area and en suite shower room. To the first floor are two further bedrooms and cloakroom. The property benefits from galleried landing, gas central heating, double glazing, large single garage with electric door and block paved large parking area to the front. There is an enclosed rear garden with level, enclosed paved patio area and with one step down to further lawned area. The family bathroom comprises of a bath, pedestal wash hand basin, low level WC and double shower, airing cupboard with radiator inside, half tiled walls with decorative border, two stainless steel radiators, coving to ceiling, spotlights, ceramic tiled floor, uPVC double glazed window to side, built in mirror with lights, extractor fan, panelled door.